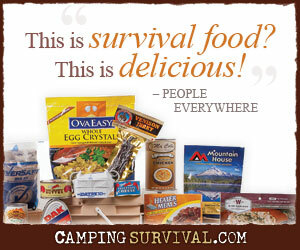 If you were to suddenly find yourself in a survival situation, what would you need to make it through? You may be tempted to immediately answer with “a good knife, a way to make a fire, and some cordage” or something like that. And that’s a very reasonable and considered response. Others may want to ask some clarifying questions. “What is the scenario? Woodlands or desert? Arctic or swampland?” Ahh, good observation. Where you are helps to determine your immediate needs. But what I’m talking about is really much more fundamental than that. At its core, the odds of survival depend heavily on three fundamental yet interdependent components: physical supplies, intellectual knowledge, and emotional toughness. Sure, you can sometimes substitute one for another. For example, the fewer supplies available the more knowledge and toughness will be required to survive. But when you get right down to it, you’re going to need a good combination of those three things to survive any situation. Most people naturally think about supplies first when they consider surviving tough circumstances. And with good reason. The proper supplies can certainly make things much easier for you. Whether surviving in the wilderness or persevering through an economic collapse, you should take an inventory of the available resources so you can make the best use of them. For example, if you somehow get lost during a day-hike and you don’t know how long it may be before you’re rescued, you’ll want to make the best of the resources you have available. Only have one PowerBar? You have options. You can eat it all in one sitting. Or you can ration it over the next few days. Perhaps you could use a small piece of it as bait to hopefully get more food. Plan accordingly and make the most of it. Good supplies can offer a great deal of comfort and can certainly increase your odds of surviving. A knife, a multi-tool, some matches, a container for water or cooking, or even a good supply of food go a long way toward effecting survival. But having the best gear may not be enough. You have to know how to use it. There’s a lot of truth in that. Having the right gear and a bountiful supply of food can help anyone survive. But there will come a time when the gear is accidentally left behind or breaks at an inopportune moment. The food will eventually run out even with rationing. Having the right skills can greatly improve your chances. Can you build a debris hut to keep you warm and dry using only those things you can find in laying around the forrest floor? Can you snare and prepare a squirrel to provide additional sustenance when the food supply runs short? Can you identify wild edibles to help diversify your diet? Still not convinced that skills are necessary if you have enough supplies? No amount of supplies can help with some events. Wilderness first aid is a prime example. Can you set a broken arm, help deliver a baby, or treat hyperthermia? These are good skills to acquire before you need them. When the first two items are in short supply, you’ll need a great big dose of the third: emotional toughness. Some may call it “the will to live” others may know it as “a calmness under pressure.” Whatever you call it, having the internal fortitude to persevere during tough times is absolutely critical. Without the gumption to keep going day after weary day, without the optimism to keep yourself occupied by bettering your situation, without continually remembering the reasons you want to make it out alive, you’ll be at great risk of simply rolling over as allowing yourself to slip into a slow spiral downward along with your odds of survival. To have a chance at survival, you must dig deep and find that will to persevere. People can do amazing things when they are really want to. As a final thought, consider this. If you found yourself stranded with another person, what kind of person would want along side you? Would you want someone with good supplies, but little knowledge and a bad attitude. Not me. No way. I’d rather go it alone. No, I’d much rather have someone with a great deal of knowledge and positive, can-do attitude. With those two traits, we could make it just about anywhere. So what about you? Do you have the knowledge you need? Are you cultivating a can-do attitude? If so, how? I’d say that’s a pretty accurate assessment. Skills and attitude over stuff almost every time. I saw this many times in the Corps. Guys I thought would do great in tough situations would just fold up and the sometimes the guy that I thought wouldn’t do that well would be steady as a rock. Sometimes it’s hard to judge who’s going to do what until the pressure is on. Then their “true light” shines pretty quickly. I agree completely! These are all things we try to develop in our selves (first!) and in our children’s characters. These are some of the essential things that are at the chore of our curriculum choices for homeschool as well as how we spend our “free time”. Thanks! The best part is that these are character traits that, once developed, will help in most every aspect of life. Very good, but I would add one more though. In addition to having intellectual knowledge of survival skills , it is also necessary, to have skills. By skills, I mean dirt time, muscle memory, experience, practice. Absolutely, Cache Valley. I couldn’t agree more. Common sense to me. Taught my sons to be self reliant. All that you said is useful. I try to share good plans. Better to have the knowledge and never have to use it than to need the knowledge and not have it. My father taught that to me.